Brunel Ahlulbayt Society runs events all round the academic year. The events are purpose built to allow students to socialise as well as build themselves as individuals. The events cover a variety of activities including however not limited to: sports, discussions, lectures, trivia nights, and Q&A sessions. You can find the complete list of events on our 2018/19 year calendar here. 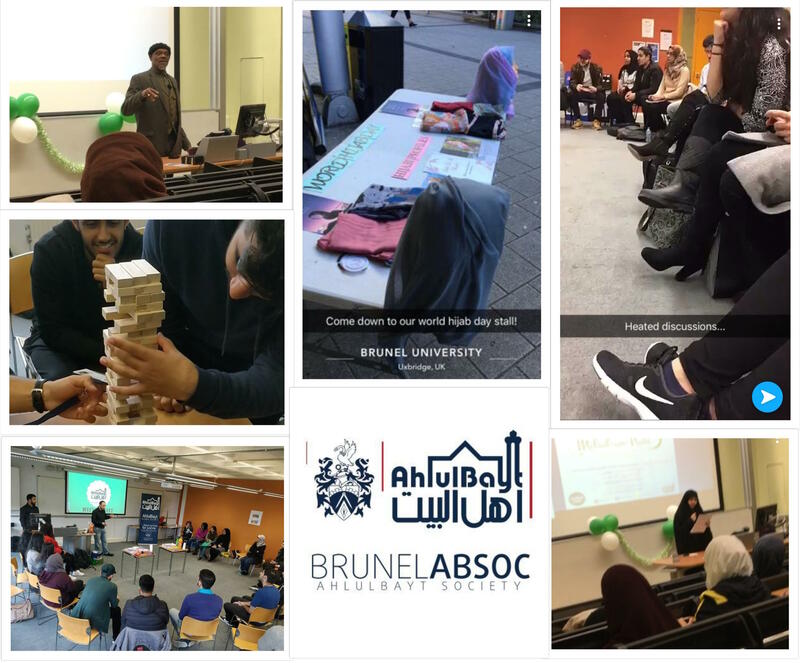 The Brunel Ahlulbayt Society operates as society under the Brunel Student Union. We are a religious, humanitarian, and social society. With over 50 official members, our largest events attract crowds of over 100 people. Here at Brunel AbSoc we hold regular discussions and trivia nights regarding various topics, these include discussions about current events, addressing controversial topics, and exploring the global geo-political climate. Alongside the captivating discussions and trivia nights, we aim to host the Inter-Brunel football and cricket tournaments in October/November and January/February respectively. Additionally most of these events are also organised in ways to raise money for different charities in the UK and Abroad. This way we make a difference at home and internationally!!! The money from your kind and generous donations will be used for the organisation and smooth running of events, specifically to pay for speakers, refreshments, advertising. The average cost of an event sums up to £250. You can find the detailed budget breakdown for events here.Any excess funds will be used to further heighten the success of the events (i.e. event promotion). Along with being able to partake in the events yourself you will also recieve an email of appreciation and provide feedback for events that you attend. You don't need to give money to help us, simply share this project with anyone you think would support us – on Twitter, Facebook, LinkedIn, by email, telephone, in a chat over the fence or on your blog. In fact, share it with everyone you know as we think it's a great idea, and the more people who know about it, the more likely we are to make this work out brilliantly. And we know we said you don't need to give money to help us, but we'd love it if you did! Please sponsor us and help make this happen. A card signed by the team to say thankyou and a box of chocolates in return for your sweet gesture. A card and book signed by the team to say thankyou for all your help.